TiO2/SnO2 nanocomposites are studied as potential candidates for gas sensors. Commercial metal oxide nanopowders milled for 1 h in ethanol are used for preparing nanocomposites with varied composition from 100 mol% TiO2 to 100 mol% SnO2. 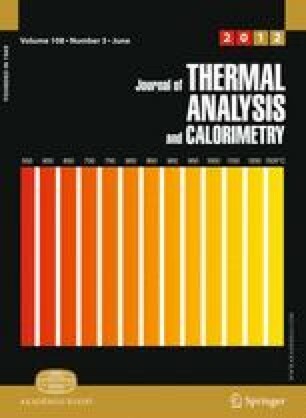 Brunauer–Emmett–Teller (BET) adsorption isotherms served to determine specific surface area, SSA. The particle size distribution is established by means of Dynamic Light Scattering, DLS technique. Differential Thermal Analysis and Thermogravimetry, DTA/TG measurements within the temperature range of 20–900 °C indicate better stability of nanomaterials composed of bigger particles or agglomerates. The total mass loss varies from 0.9 to 8.5% for 100 mol% SnO2 and 100 mol% TiO2, respectively. The only gaseous products of decomposition are water and carbon dioxide. X-ray diffraction analysis of nanocomposites indicates two separate phases of different crystallite size, i.e., smaller rutile TiO2 (9 nm) and larger cassiterite SnO2 (28 nm). Gas sensor dynamic responses at 400 °C to the reducing gas—ammonia (NH3) are detected in the concentration range extending from 100 ppm to −5000 ppm. Nanosensor of 50 mol% SnO2/50 mol% TiO2 is stable and sensitive to the interaction with NH3 and gives the highest response at 400 °C. This work was supported by the Polish Ministry of Science and Higher Education (2009–2012) grant no. N N507 466537. Di Francia G, Alfano B, La Ferrara V. Conductometric gas sensors. Hindawi Publishing Corporation, Journal of Sensors, 2009. doi: 10.1155/2009/659275.